Join the CLIL revolution! 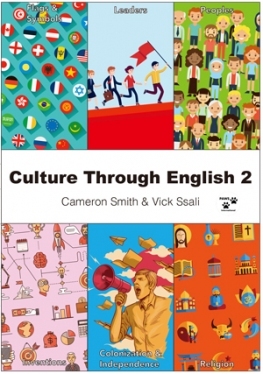 Culture through English 2 takes a variety of great language topics – flags, leaders, inventions, religion, and more – to teach students both English and the cultural history of English speaking countries. CLIL (Content and Language Integrated Learning), has spread from multilingual Europe to the rest of the world. By teaching academic subjects through a foreign language, it truly motivates students to understand and use the language that they read and hear. Each unit of Culture through English 2 presents two content lessons and then challenges the students to engage their critical thinking skills to research and present their own third short lesson on a similar topic. Students gain both language and research skills, and also foundation knowledge about English speaking countries. Especially written for Japanese students, each unit also comes with English-Japanese vocabulary, as well as examples from Japanese cultural life to help students acquire key concepts.